Speak Up is a one day course for women who want to get ahead at work. Masses of research has shown us the obstacles women face when pursuing promotion – men interrupting women, unconscious bias at play, imposter syndrome, women’s voices not being heard, male management styles being rewarded, unequal pay, very few senior women to have as role models or mentors, and so on. The list is quite long. Well, I have looked at this research and the ‘fight’ back begins here. To be clear, in no way is this an anti-male course and I use the term ‘fight’ loosely. It’s pro women and that is something very different. It’s pro you and your career. It is a course designed to look at some of those obstacles facing you in your career advancement and devising practical, workable strategies to over come them. You’ll leave with a plan of action and a journal to both inspire and enthuse you. With my help you work out what is right for you. There is no formulaic response – It’s all about you. Who is Speak Up Suitable For? Any woman who wants to think seriously about her career and how to get ahead. Any woman who wants to understand more about some of the gender dynamics at play and how this may be impacting on her. Any woman in an organisation with a commitment to gender equality who wants to learn more and take full advantage of what is on offer. Having attended a RenewYou course is not necessary as this is a stand alone course, but it is a great follow up if you are a RenewYou graduate. What Will You Get From Speak Up? One whole day away from the hurly burly of the office to think about your career. The opportunity to network with like minded women. An understanding of how to communicate more effectively. Access to an audio download version of Speak Up with exercises to refresh and renew your motivation. A follow up one to one coaching session with me. 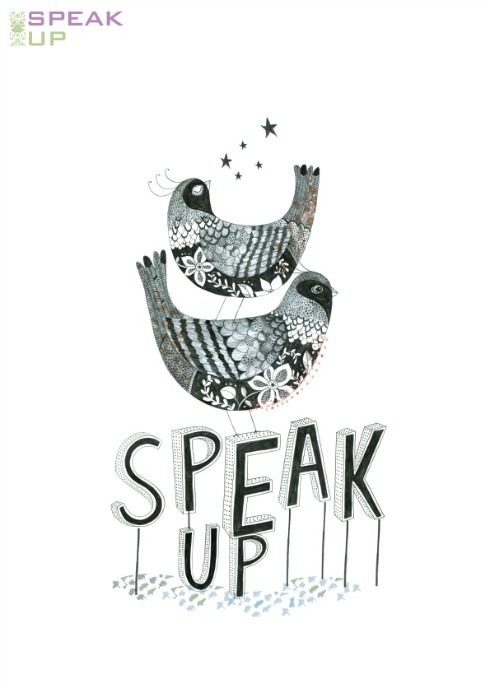 The Speak Up logo was especially designed by Rosie Harbottle for Changing People. Update: I’ve had so many requests from individual women who would like some support in this area that I have devised a downloadable version of Speak Up. You will be able to work through some of the exercises at your own pace, using the audio downloads with the added bonus of a relaxing visualisation. You can download it from the shop and get started immediately. Click here to hear more. Women attending the course will get access to this as part of their day.